I have cake. Yep I made a cake this weekend but not just for any old reason (not like making cake needs a reason); It was my mother’s Birthday this weekend past. Now you may think Right now I am about to rant on and on about how great she is because is caring, loving, understanding etc. ; however I will tell you a story which demonstrates those qualities better than any words. Over the past few days she has waited on me had and foot to provide me with anything that I needed and constantly asking if I feel ok. Even today, when I got the bad news I have to go into surgery immediately, she tried to take the few days off work in order to be there with me for the appointment with the dental surgeon. Bear in mind I am 20 something and I should in theory be able to take care of myself. The pain has reduced me down to shivering, whiny little kid; even with me being so annoying she has put up with the moans and crying about the nerve pain and me being worried it something more serious (well I am not sure what is more serious than teeth growing into with teeth, but there has to something worse). I am not sure if I conveyed the selflessness of my mother but I hope it come through with this story. For her birthday cake she has always opted for simple cakes. 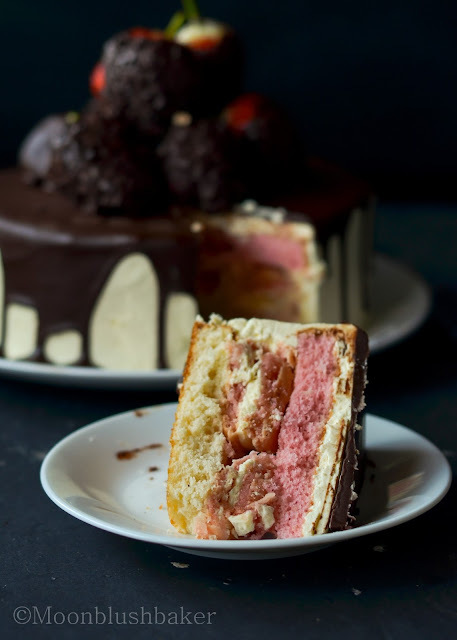 I think this I due to her Asian childhood were sponge cake with fruit and cream was considered the ultimate treat. However I could not just settle for something that simple, so to make it my own I added a bit of excitement into the simple sponge layer cake. 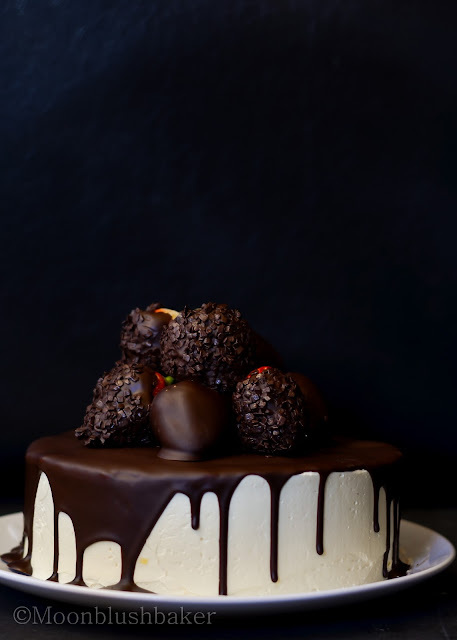 You know me nothing is fun when it plain especially when it comes to cake. 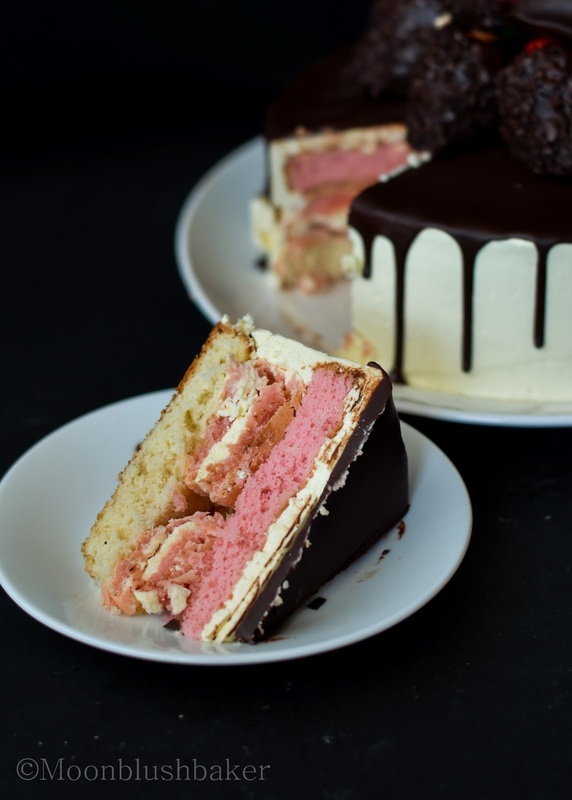 Sandwiched between two layers of Genoise sponge cake (one flavoured with vanilla and one strawberry) are macrons with strawberry milk flavouring in the shells and filled with simple vanilla swiss butter cream with tiny strawberry pop rocks. Maybe this is a waste since they did not exactly “pop” but the flavour was still there. Covering is the Swiss butter cream and finished off with a coat of bitter sweet chocolate and chocolate dipped strawberries. 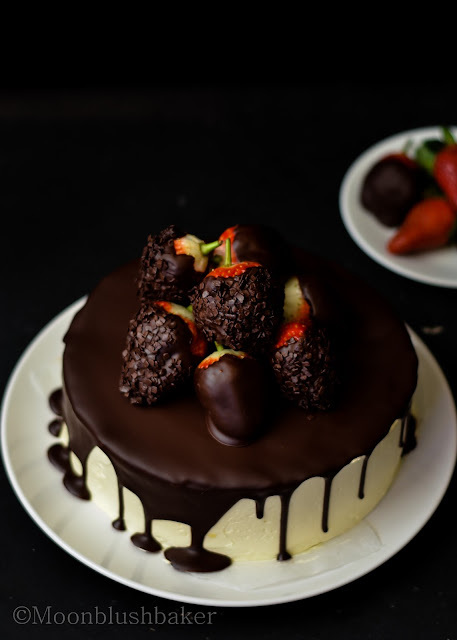 I am not going hassle you make this cake because this is symbol of my love for MY mother. 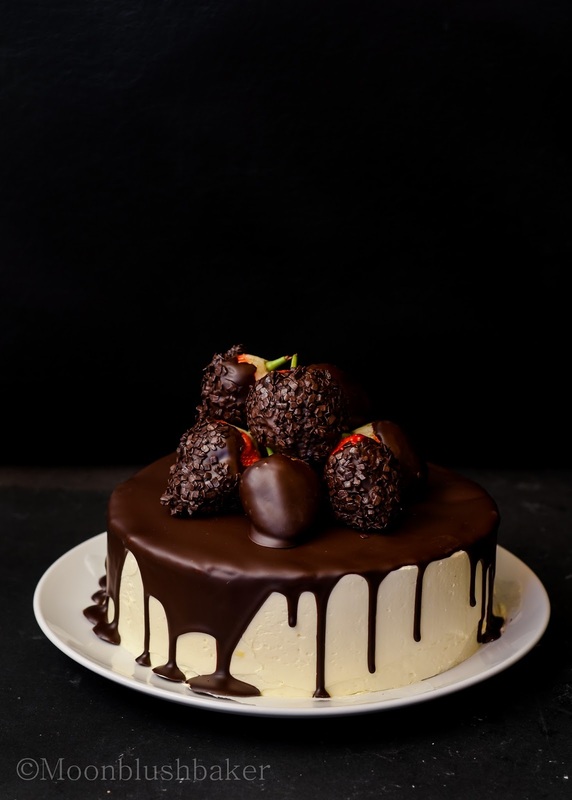 You should find a recipe and cake design that reflects you love for your mother next time it is her birthday. Whether you use the same flavours as me or go completely 360, personalise your celebration cake. At the end of the day it is something that your mother and you love not the rest the of world. 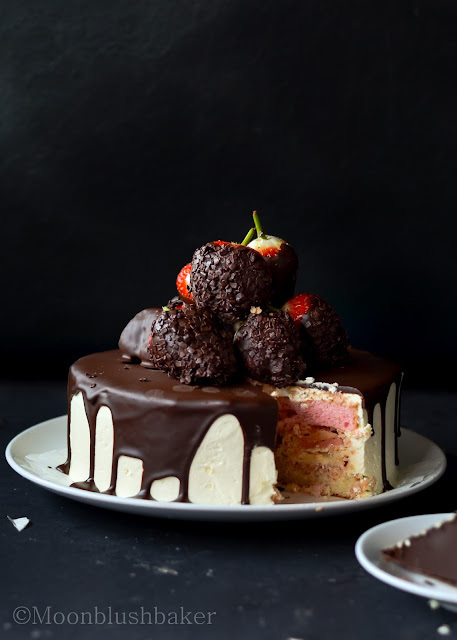 Chocolate Dipped strawberry cake with macaron pop rock layer. 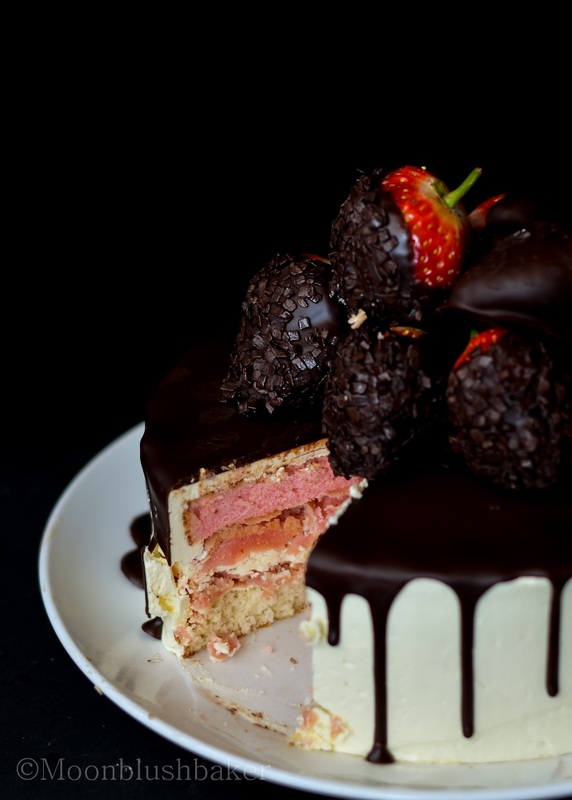 STRAWBERRY Version- ADD 40g Strawberry milk powder to the recipe and reduce sugar to 150g. Preheat oven to 185c. Grease and line 2 x 22cm spring form tins with baking paper. Prepare a saucepan with simmering water. While whisking add the sugar (and milk powder if creating strawberry one) slowly once it is at the foam stage. Keep whisking to it is thick and glossy but it will very wet like (not like normal meringue). Remove bowl from electric mixer and place over the simmering water. With a large whisk, beat the mixture until it reaches a temperature of 40C. Use a thermometer for this part as you need to stabilise the egg yolks before adding flour. Return to stand mixer and whisk until it forms soft peaks. Remove bowl from mixer and shiver in your flour. Fold the flour into the egg mix. DO not over work! Bake at 180C for 20-25 until the top is golden brown, and the skewer is inserted and comes out cleanly. IMMEDIATELY turn the cake out on to a wire rack. To do this place a cooking racks on the top of the cake and gently flip it. 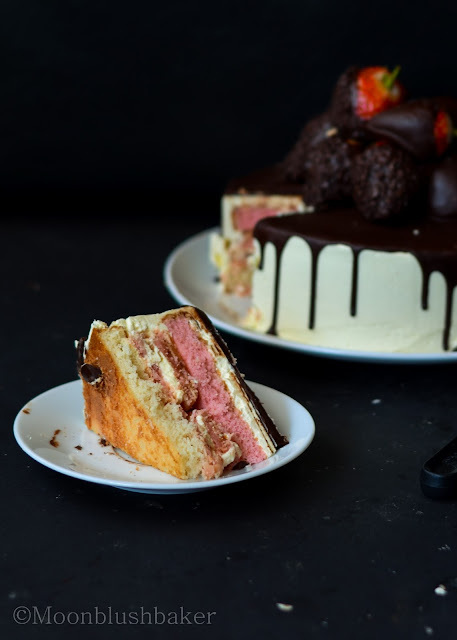 After 10 minutes, flip the cake over on to it base using the same technique suggested above. Store in fridge for up to three days in cling film. MAKE NO CHANGES TO THE RECIPE FROM HER WEBSITE. Place the powdered sugar and almonds in a food processor and give them a good pulse until the nuts are finely ground. Add them to the meringue, give it a quick fold to break some of the air and then fold the mass carefully until you obtain a batter that falls back on itself after counting to 10. Give quick strokes at first to break the mass and slow down. The whole process should not take more than 50 strokes. Test a small amount on a plate: if the tops flattens on its own you are good to go. If there is a small beak, give the batter a couple of turns. Fill a pastry bag fitted with a plain tip (Ateco #807 or #809) with the batter and pipe small rounds (1.5 inches in diameter) onto parchment paper or silicone mats lined baking sheets. Let the macarons sit out for 30 minutes to an hour to harden their shells a bit. In the meantime, preheat the oven to 280F/150C. When ready, bake for 15 to 20 minutes, depending on their size. Let cool. If you have trouble removing the shells, pour a couple of drops of water under the parchment paper while the sheet is still a bit warm and the macarons will lift up more easily do to the moisture. Don’t let them sit there in it too long or they will become soggy. Once baked and if you are not using them right away, store them in an airtight container out of the fridge for a couple of days or in the freezer. Fill them with butter cream and small amount of pop rocks on sandwiching them together. Melt chocolate over low heat until it is smooth and glossy. Allow to cool. Take your sponge fill it with 1/2cup of butter cream. Push in macarons and top with dots of butter cream to act as glue. Top with strawberry layer. Create a crumb coat on the outside with an offset spatula. Return to fridge for 1 hour. Create the final white layer on a turn table, smoothing a cleaning the spatulas as you go. Return to fridge over night. Make chocolate glaze and cooling sightly. 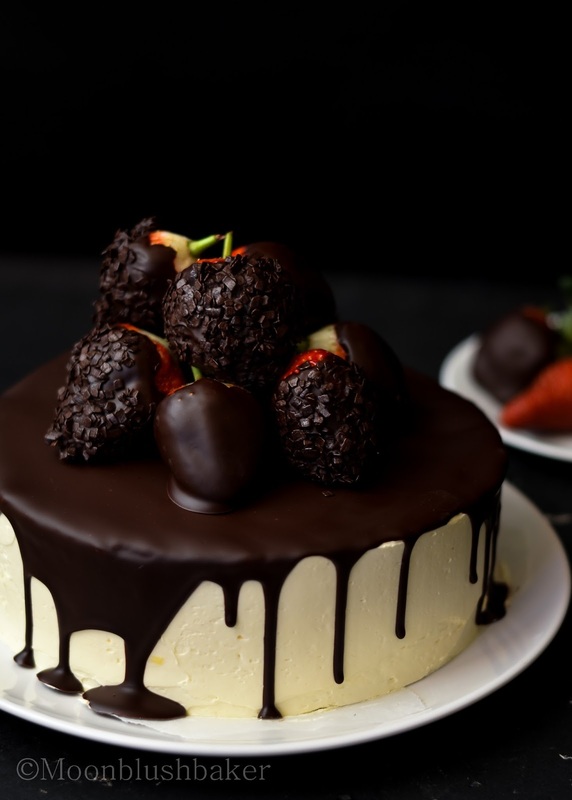 Remove cake from fridge and place on a wire rack. Pour 1/2cup of glaze and spread it with a spatula. Allow it to slightly dip on the sides. 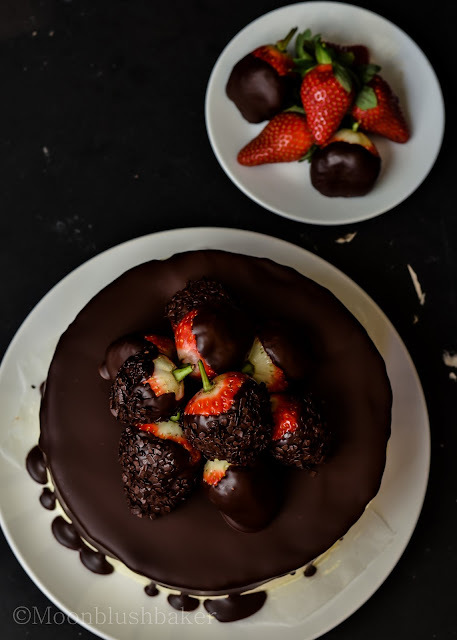 Top with strawberries in chocolate coat. The cake looks absolutely stunning and delicious! Aren’t moms amazing? I’m so grateful for my amazing mother, and I hope my little girls will feel the same about me! I am getting there! Thank you for your concern!